Universal Arm Sleeve (33.5 x 12.5 Inches) - SHIPS FREE! Poor circulation and swelling in the limbs from conditions such as peripheral artery disease or edema can occur in one or both arms when a lymph node has been damaged or removed per cancer treatment protocols. This can cause disfiguring in the arm from the intense swelling and can even be very painful. 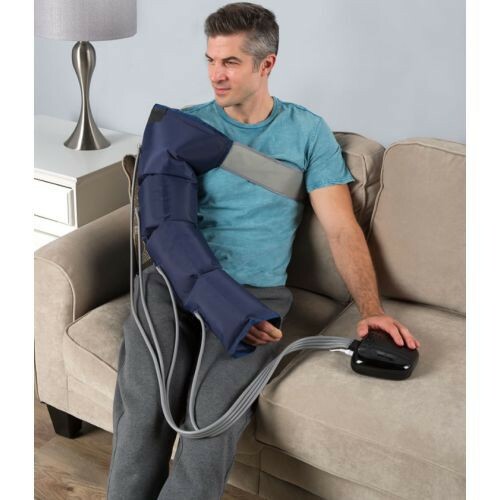 The Circulation Improving Arm Wrap by Hammacher Schlemmer provides important compression therapy to remove that blockage and reduce pain and swelling. The lymphedema sleeve with pump inflates and deflates the wrap using six airbags within the upper and lower arm region to assist blood vessels in expanding and contracting to get blood flow back to the heart. The Circulation Arm Wrap connects to a corded remote allowing user to customize the compression force. There are three levels of intensity and eight programs to choose from. The universal arm sleeve has adjustable hook-and-loop closures to fit most sizes. The additional strap around the chest creates a secure fit during therapy sessions. In between sessions, wear a lymphedema arm sleeve to restore arm shape with moderate 20-30 mmHg graduated compression. 1. What is the exact price for the product? 2. Is the machine battery operated or plug-in? 3. How long does it take to ship? Prices are subject to change and are based on a number of factors, including special offers. This item is operated via plug-in. Shipping can be done as quickly as 1-2 business days or 7-10 business days depending on the consumer's choice.